The Lions are back on top! 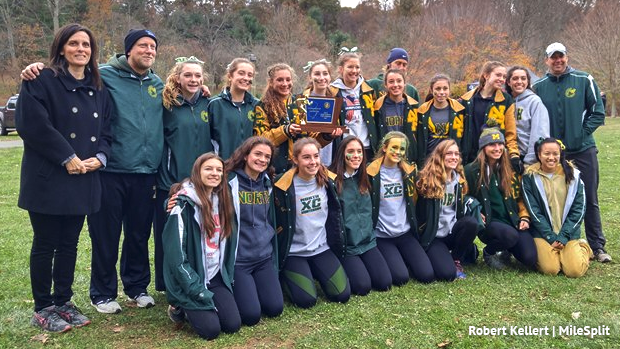 After close losses and tough finishes the past couple years NJ#1 ranked North Hunterdon was extra motivated to roll into Holmdel and leave holding the NJSIAA Meet of Champions trophy. North Hunterdon achieved that goal scoring 100 points, 4+8+16+29+43, and averaging 19:28. They had a 26 point lead over second place Kingsway, Colts Neck finished third at 135. The scoring started off when sophomore Chloe Gonzalez finished fifth with a Holmdel PR of 18:30. Gonzalez stepped up her role later this season with team leading finishes at both Groups and MOCs. Dropping nearly a minute since her first appearance at Holmdel this season when she ran 19:26 the Shore Coaches Invitational in early October. Emily Nugent was 16th at 19:08, Ellie DiMarcello 28th at 19:27, Samantha Kehler 51st at 19:58, Brenna Talamo 72nd 20:17, Angela Kearsley 87th 20:30, and Alexandra Carlson 96th 20:43. All seven of those girls make a return next fall to defend their state title, two sophomores, four juniors, and one freshman. Their last state championship came in 1986, the end of a four year streak and dominating run of six titles in a seven years span. "It feels amazing," stated junior Emily Nugent. "This is our first title in 31 years, so I think this win is definitely going to start another streak of titles for North Hunterdon." Angela Kearsley was caught up in the emotion of the moment and almost couldn't answer Jim Lambert's question reflecting back on their trials the past few seasons. "You've just reminded me of all the hard work we've put in since our freshman year." In 2016 North Hunterdon finished second to a Ridge team they traded wins with earlier in the year, in 2015 North Hunterdon had a rough showing at the Meet of Champions after coming in as potential contenders. In 2017 they left the historic Holmdel Park course champions, with the potential to defend their title going forward. The Kingsway girls stepped up in a big way to finish second with 126 points and an average of 19:45, an 18 second improvement over their Groups run. The weekend prior they advanced as a wild card placing fifth as a team in the Group 4 Championship. A big difference was a return to form for Lauren Krott who finished a minute faster than last week taking 34th at MOCs with a 19:35. They were led by senior Alexis Mullarkey in 19th with her 19:09. A remarkable year for the school Kingsway finished second overall in both the boys and girls team races. Colts Neck finished third with 135 points, they won their second straight Group 3 title last week. Junior Colleen Megerle lead the team on Saturday placing 30th with a time of 19:29.